We come into contact with countless man-made chemicals every day. There is often a delicate balance between a chemical’s usefulness and the potential danger the substance poses to our health or environment. There has been much debate in recent years about certain chemicals, such as those used in nonstick cookware and those used in flame-retardant children’s sleepwear. A new study from a major university is raising a new concern regarding a chemical that has drawn much scrutiny in recent years – bisphenol-A or BPA. This study and others like it are of major concern to our Oakland toxic chemicals attorney, Gregory Brod, who works with people made ill by the ever-increasing presence of toxic chemicals in our modern lives. A Stanford University study, covered in an Associated Press article carried by The Oakland Tribune, suggests high levels of BPA may raise the chance of a miscarriage among women who are already prone to miscarriages or had difficulty conceiving. Importantly, scientists suggest the study cannot be considered conclusive at this time. However, Dr. Linda Giudice, the president of the American Society for Reproductive Medicine and a California biochemist, said the study adds to “the biological plausibility” that BPA may impact on fertility and other health issues. Nonetheless, a group of obstetricians called for further study of potential fertility hazards due to environmental chemicals. In general, BPA and some other environmental chemicals may cause low-level hormone-like effects on the body. Although BPA has been slowly removed from reusable drink containers and baby bottles (a big concern given that a small amount of hormones makes a larger impact on a tiny body), tests find BPA in nearly everyone’s urine. The Food and Drug Administration disagree with the people/groups sounding alarms and say BPA is safe as currently used in food containers. 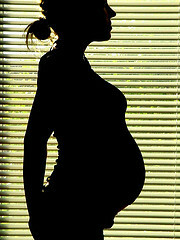 Dr. Ruth Lathi, a reproductive endocrinologist at Stanford, notes that egg or chromosome problems cause most miscarriages and that a study in mice suggests BPA may have an impact on that risk. Along with a research team (and assisted by a federal grant), Dr. Lathi and her team looked at the blood from 115 newly pregnant women, all of whom had past problems with infertility or miscarriage. Sixty-eight of the women later miscarried, while 47 had live births. The research team divided the blood samples from when the women were still newly pregnant into four groups based on blood levels of BPA. Those women in the top quarter (i.e. with the most BPA) were 80 percent more likely to miscarry than the lowest quarter, despite similar age and other risk factors. However, this study is considered relatively small, resulting in a big range of possible risk ranging from slight elevation to 10 times more risk. Dr. Lathi also noted that women with higher BPA levels may have also had other miscarriage risk factors that might be amplified by BPA. Ultimately, the study alone is not a call for great alarm. However, it is far from the only study calling for concern about BPA. WebMD notes that we still don’t know definitively. The FDA suggests current levels of BPA (notably reduced due to efforts in recent years) are safe, but admits some concern about the impact on fetuses and children. Overall, looking at the FDA comments and the available studies, WebMD suggests BPA may impact: Hormone levels; Brain and Behavior issues; Cancer; Heart problems; and Other conditions (i.e. too early to show a link, but some believe BPA impacts obesity, ADHD, diabetes, and other health issues). All of the effects seem most pronounced in infants (with potential fetal exposure) and young children. If a manmade chemical caused you or your child harm (including miscarriages), call Attorney Greg Brod. As an Oakland dangerous chemicals law firm, Attorney Brod and his team can help you recover the monetary damages you deserve.